So you’ve finally decided to lose weight. Great! The next big question is, where do you start? It can be overwhelming especially for a first timer. But the trick is to keep is simple. One of the best ways to start is with the 1,200 calorie diet. What is a 1200-calorie diet? As the name suggests, the 1200-calorie diet involves limiting your caloric intake for the day to only 1,200 calories. The trick to weight loss is to create a calorie deficit by either eating less or exercising more or both. The number of calories we should be consuming each week typically varies from person to person. How it’s calculated often relies on age, gender, current weight, metabolic health, height, and level of activity. Let’s say you’re a 35 yr. old woman, 5 foot 5 inches in height and lives a fairly sedentary lifestyle. You’ll need fewer calories per day compared to someone with similar stats but lives a moderately active lifestyle. The main rule of thumb is, the more active you are, the more calories you will need in a day to keep up a steady and healthy weight loss. Otherwise, fewer calories lead to a very restrictive diet plan and that’s not good either. Prolonged dieting of less than 1,200 calories per day slows down your metabolic rate and worst, it forces your body to burn off muscle instead of fat. According to the CDC, the ideal way to lose weight is to do it steadily and gradually; that means about 1 to 2 pounds per week. The American College of Sports Medicine recommends that women should eat at least 1,200 Calories per day, and men should eat at least 1,800 for steady and gradual weight loss. Use a food tracking app to keep track of your daily caloric intake. You can view some of our fave food tracking apps here. For your meals, try to keep your meals between 300-350 Calories and add two healthy 100-calorie or less snack mid-morning and mid-afternoon. Greek Yogurt with Muesli, Nuts and Fruit (198 Calories for one serving) and fresh orange juice (111 calories for one cup). Mix 85 grams of fat-free yoghurt, roughly two tablespoonful of Muesli, a few pieces of walnuts, sunflower seeds, raisins, cranberries, blueberries or raspberries. Sweeten with half a tablespoon of sugar or Stevia and enjoy! 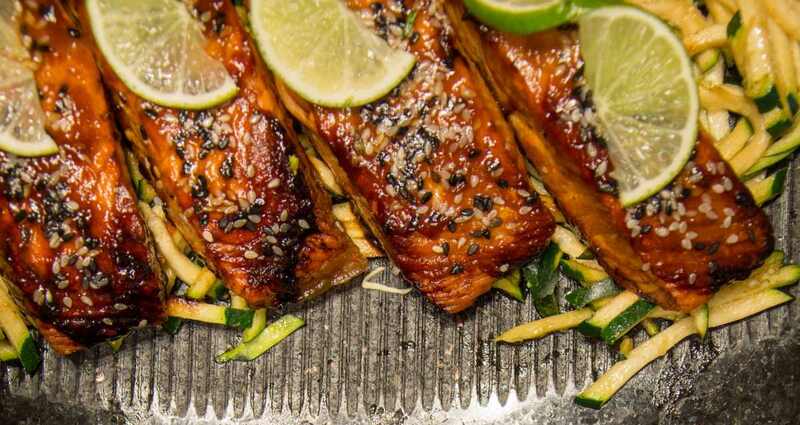 Simple Hoisin Glazed Salmon with roasted Zucchini (283 Calories for the salmon and 33 Calories for the roasted zucchini). Combine soy sauce, water, hoisin sauce, garlic paste, ginger, honey, and lime juice. Heat in a pan until the sauce becomes sticky and syrupy. Preheat the oven at 350 F. The ideal serving size of salmon is 2 or 3 ounces or the same size as a deck of cards. Brush the salmon with a thin layer of glaze and cut a medium-sized zucchini in large julienne slices, coat with a little vegetable oil or olive oil and season with salt and pepper to taste. Place zucchini under the salmon and bake for 15 minutes. After, sprinkle sesame seeds and serve warm. Pound the skinless chicken breast to even thickness. In a pan, melt a little bit of butter and a little olive oil. Cook the chicken for 3 minutes and flip the chicken to the other side. Add fat-free low-sodium chicken broth, lemon juice and capers. Simmer for another 3 minutes while basting the chicken to prevent it from drying. Add parsley and cook for another minute. Place Asparagus in a sheet pan and add 2 tablespoons olive oil. Add salt, pepper and your herbs of choice. Preheat oven at 425 F and roast the asparagus for 5 to 10 minutes. Sprinkle 1 tablespoon of grated parmesan while still warm. Total calories for the day: 1,114 Calories. You can use canned roasted pepper or roast them yourself. Puree and add some onion, garlic and seasonings. Preheat oven at 160 C or 320 F. Place the roasted pepper sauce in an individual baking dish or a skillet and add the egg/s on top. Season the dish with salt and pepper and bake for 7 to 10 minutes. Serve with a sprinkling of parsley on top and a slice of bread on the side. Mash avocado and season with salt and pepper and toast two pieces of multigrain bread. Spread the mashed avocado on the toasted bread. Slice 3 ounces of poached or baked chicken breast without the skin and add on top of the avocado. Add slices of tomato, season with salt and pepper and top with the second piece of bread. Sautee the shrimps in 1 tablespoon of olive oil for 2 to 3 minutes and season with salt and pepper. Once cooked, remove the shrimps and set aside. Add 1 tablespoon of olive oil to the same skillet and sauté the spiralized zucchinis until tender with some garlic. Then add back the shrimps and stir in pesto sauce. To serve, add a sprinkle of parmesan cheese. Grill one drained 4-ounce pineapple until you see visible grill marks. Place in a serving container and top with 2 tablespoon low-fat vanilla yoghurt. Add 1 tablespoon of honey and sprinkle chopped pistachios. Total calories for the day: 1,185 Calories. Mix 1/3 cups oats, 1/2 cup almond milk, 1 teaspoon chia seeds, maple syrup, and vanilla extract in an airtight container and refrigerate overnight. Serve and top with 1/2 sliced medium banana, 1/3 cup blueberries and slivered almonds. Combine cook bulgur, chickpeas, feta cheese, bell pepper, chopped radish and minced red onion in a container. Add in the dressing of olive oil, white wine vinegar, 1 tablespoon honey, fresh lemon juice and lemon zest. Combine the garam masala, turmeric, salt and pepper and add 1 tablespoon of the spice mix to cut tofu pieces. Cook in a large skillet with 1 tablespoon of oil over medium-high heat for 8 to 10 minutes until brown and set aside. Add in 1 tablespoon of oil in the same pan and cook the onion, bell pepper, ginger and garlic. Add a flour slurry and the remaining spice mix and stir. Next add tomatoes and bring to a simmer until the vegetables are tender. Add back the tofu and stir for 2 minutes. Remove from the heat and stir in 1/3 cup half-and-half. Total calories for the day: 1,233 Calories. A little over but still good. Jumpstart your way to weight loss today with Simply Slender and Simply Slender Charcoal Lemonade! Get Simply Slender today!